One of the top and most trusted Car Dismantlers in Melbourne offer to buy all your old, used, scrap, junk and unwanted cars. Get cash as high as $14,999 for your cars right away. We buy all kinds of cars for dismantling, wrecking and recycling. If you currently own an automobile that has been sitting in your garage for too long. Or maybe one that is damaged to the point where the repairs alone would cost more than the car’s actual worth. This is where you should consider selling it for scrap. Now there are a number of junk car buyers but you need to find the most reliable one. One that offers the best price and a maximum number of benefits. Car Dismantlers happen to be one of the oldest and largest car dismantlers in Melbourne. We have spent years in serving the automotive needs of our customers. Which, as a result, has to lead us to our benefit and success as one of the most trusted auto wreckers and dismantlers in Melbourne, Australia. Years of experience in the business has not just come to our advantage. But has also enabled us to provide our customers with numerous benefits. We have been successful in creating a team of qualified professionals. Each of them has earned a reputable stance and can be fully trusted with all kinds of auto dealerships. We provide free towing & car wrecking services in Melbourne Metro Area with Cash for cars upto $14,999. How much cash i can get? Depending on your car condition we can pay you up to $14,999 on the spot. When selling car to us, we do not charge for towing. We pick your vehicle and pay cash on the same day. No hidden fee. All you get is money for your scrap broken or damaged cars. What Car do we buy? No matter what car you have, we pay money for it. Any Make Any model we buy it all. Cars, Trucks, Vans, Utes, get cash for anything which is a vehicle. Our company aims to provide the best deals in all used, junk, broken, scrap or any unwanted cars. Anyone with an inoperable car can benefit from our services. By simply putting it up for sale at our wreckers yards. We intend to give our customers the exact worth of their cars in exchange for what they want to get rid of. We buy all unwanted cars that we bring to our yard with fine expertise. And come up with the best solutions. Whether your car requires minor fixes, dismantling or even need to be completely salvaged. Our experts skillfully take care of each procedure. We happen to have assembled one of the best customer care team. Moreover, our friendly staff cater to all your queries and responds immediately. Call us at 0416 122 197 and have our team listen to all your auto-related concerns. Each of our services is guaranteed to be remarkably flawless. Car Dismantlers have decades of experience in dismantling and recycling the autos for good. We have some of the best credentials as well as the authentic certification for all kinds of auto dealerships. We buy all old, junk, scrap, broken and used cars for wrecking and their proper disposal. The cash we pay for your car goes as high as $14,999. WHAT MAKES US BETTER THAN THE LOT? With the ever-growing salvage yards and car wrecking businesses, it has become quite a challenge to find one that is better than the lot. Lucky for you, Car Dismantlers happen to be one of the most experienced and reliable companies in Melbourne. Whether you choose to have your car dismantled or you just require an evaluation. Our team will ensure a hassle-free experience.We take care of all the paperwork. After finalizing the deal, all you need to do is sit back and let us take care of the rest. Car Dismantlers have no extra fees or any hidden charges for that matter. All our services are free. Which means we provide with absolutely free towing service as well.In addition to that, we guarantee that we make all payment right on the spot. We are strongly against the idea of making our customers wait for weeks or even days for the money we owe them. 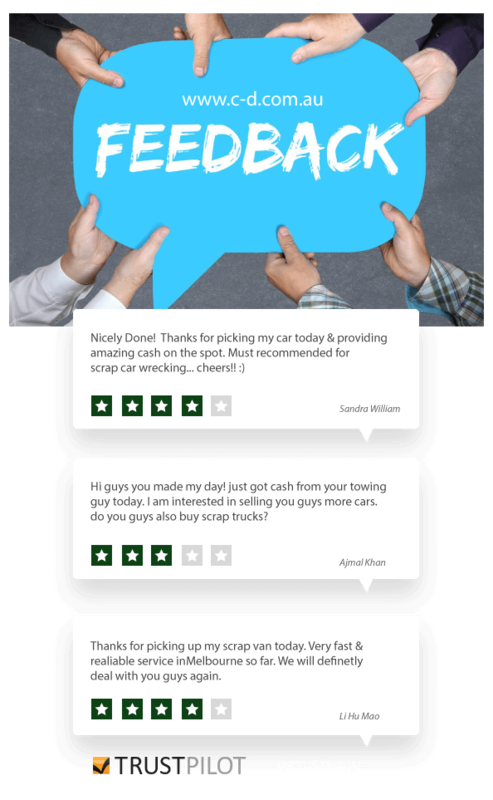 Our team instantly hands you the cash right when we come to tow your unwanted car. Even if you opt for a bank transfer instead of a cash payment. We manage to do that before your car even reaches our yard. Furthermore, our network of salvage yards spread all across Melbourne allows us access to all locations. We offer to tow your unwanted car from any suburb within one day. Not only that, our customers can avail of each one of our services anywhere in Melbourne. Next up, we always give you an option to get rid of your unwanted car on the same day. Besides being the most reliable services, we happen to be the quickest as well. Our team responds promptly and arrives at your location within 24 hours.We deal in all kinds of cars regardless of their condition, make and model. Moreover, we offer you the unmatched quote for it.